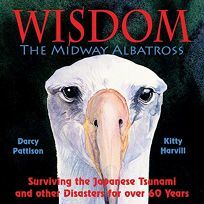 Pattison (Prairie Storms) offers a remarkable survival story about Wisdom, a female Laysan Albatross first tagged by scientists in 1956 and still alive today, having lived through multiple tsunamis, other natural disasters, and manmade threats to the well-being of her species. Born on Midway Atoll, the bird (who wouldn't receive the name Wisdom until she was rediscovered in 2002 by the scientist who originally tagged her) spends years at sea, feasting on squid, avoiding sharks, and producing chicks year after year ("By the time she was twenty," writes Pattison, "she had outlived eighty-seven percent of her rookery mates"). Harvill (Up, Up. Up! It's Apple-Picking Time) contributes carefully detailed and naturalistic illustrations, portraying both the beauty and danger of Wisdom's aquatic environment (discarded plastic and the 2011 Japanese earthquake and tsunami are among the hazards Wisdom manages to escape). While the heavy font used for the text is at times intrusive, Pattison writes crisply and evocatively, and her closing notes provide a wealth of information and resources for readers interested in Wisdom and her fellow albatrosses. Ages 6–12.